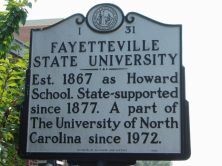 Fayetteville State University, now part of the University of North Carolina system, was the first normal school for African Americans in North Carolina. The university’s founding dates to 1867, when David A. Bryant, Nelson Carter, Andrew J. Chestnutt, George Grainger, Matthew Leary, Thomas Lomax and Robert Simmons paid $140 for a lot on Fayetteville’s Gillespie Street and named themselves into a board of trustees to maintain the property as a permanent site for the education of black children. General O. O. Howard, an early supporter of black education, erected a building on the site, and the school was named the Howard School in his honor. The education center was chartered by the legislature as the State Colored Normal School in 1877. In 1880 Charles W. Chesnutt was appointed principal of the school after the death of principal Robert Harris. Chesnutt served the institution for three years before resigning and moving to Cleveland, Ohio. Ezekiel Ezra Smith was appointed as Chestnutt’s replacement in 1883. E. E. Smith had a long and distinguished career at the school. During his span as principal (and eventually president) at the institution, he served in a host of other positions. Smith was appointed Minister Resident and Consul General of the U. S. to Liberia by President Grover Cleveland in 1888. George H. Williams assumed the duties of principal in Smith’s absence. After serving in Liberia for two years, Smith returned to North Carolina to organize the state’s first newspaper for African-Americans, The Carolina Enterprise, in Goldsboro. During Smith’s tenure, he saw the school the school move to its permanent location on Murchison Road in 1907. The high school curriculum was discontinued by the state in 1929 and Smith’s title change to president. He retired in 1933. In the 1850 census of Fayetteville, Cumberland County: Angus Carter, 45, boatman, wife Dezda, 38, and children Nelson, 16, Angus, 15, John, 13, Margaret A., 12, Betsy, 10, Jane, 8, Alonzo, 5, Mellissa, 2, and Ann, 2 months. In the 1850 census of Fayetteville, Cumberland County: John Terry, 13, Ellen Terry, 16, Sally Lucus, 12, and Thos. Lomack, 18, in the household of Jesse W. Powers, merchant. In the 1850 census of Eastern Division, Cumberland County: Griscilla Simmons, 35, Robert, 12, Samuel, 8, and Mary A., 2.